Total Square Footage: 39,766 sq. ft.
1,270 sq. ft. of space with lots of windows divided into two open office areas, a small office, and a reception area—perfect for a metro entrepreneur. 6,007 sq. ft. space new to the market that would be great for a medium or large business. It is divided into nine offices with windows, a large training room, a conference room, work rooms, and a break room. 3,763 sq. ft. of space with lots of windows overlooking a golf course divided into five offices, lots of open office space, a conference room, a work room, and a break room. 2,452 sq. ft. of space perfect for a small or start-up company with plenty of open office space to arrange to best suit your needs, a break area, and a telephone/LAN room. 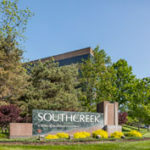 The overall benefits of renting office space in Southcreek XIV include easy access to major highways and on-site property management. To learn more about these office spaces or any of our other buildings, call one of our commercial realtors in Overland Park at 913-658-4100.